Note: The Shopping Cart still has a few bugs we’re trying to work out. To place an order, please add your Salsitas to the cart and click “Google Checkout” or send me an email. For all shipping orders send an email. Thanks! When it’s citrus season in the Valley, it’s time for Bubbie’s Haba-Lava. Tempestuous. Passionate. Complex. The words to describe Bubbie, my great-grandmother — and this torrid salsita. Haba lava. Welcome to the fire. Lovingly made with lemons from my mom’s backyard. Like the bad boy Hal is, he starts smooth and slow, but he finishes hot and fast. A smooth and creamy garlicky jalapeno sauce that goes well with… everything. 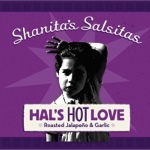 *Reminder Shanita’s Salsitas are made in small batches, which means the heat and flavor may vary. Light footed Ki throws a steady punch to the last round. More garlic than heat, this’ll add the zip & zang to your raw veggies and anything grilled. Rock god Seymour whips crowds into a sweaty frenzy. Exploding with flavor, this North African hot pepper paste will take any dish to 11.